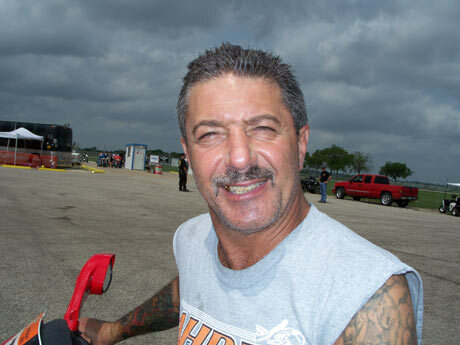 The motorcycle drag racing community was stunned when it suddenly lost one of its most successful and colorful racers, Larry “Drums” Brancaccio. 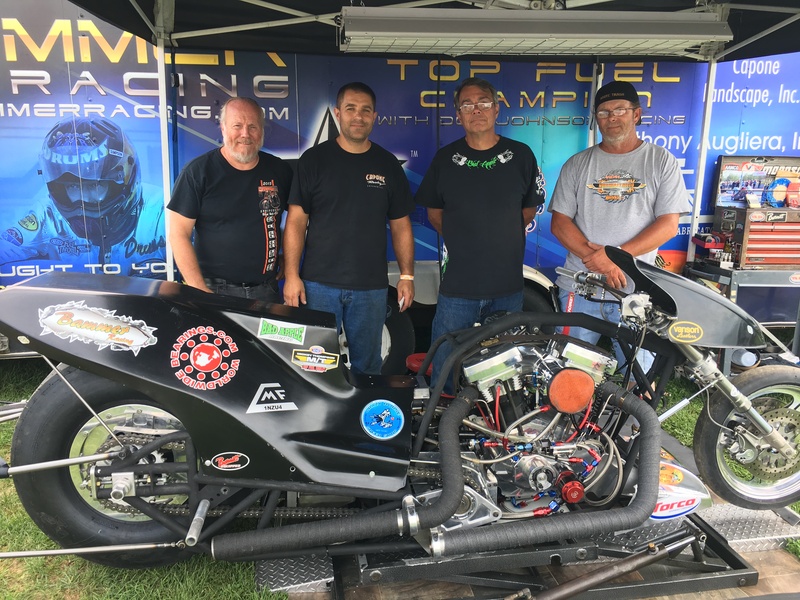 The 14-time national champion Brancaccio, who was a mainstay in the sport for more than three decades, a force in IHRA, AHDRA, AMA Prostar, AMRA, and several other sanctions, was just 59-years-old at the time of his passing. It seemed there were many successful and enjoyable years of racing ahead for the outspoken, charismatic Nitro Harley veteran. 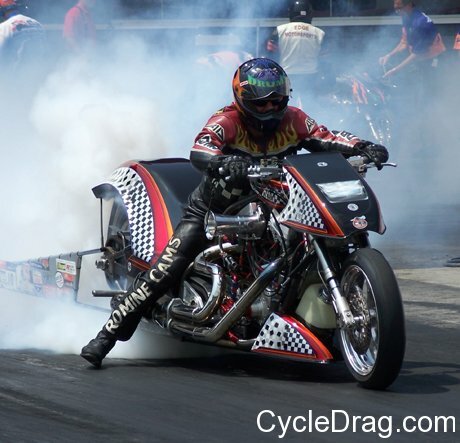 In fact, at the time of his passing, Brancaccio’s Godson Michael Hopkins was in the process of building a state-of-the-art nitro v-twin for Drums to ride. The heartbreak from the untimely passing of the legend brought the project to halt. Larry “Drums” Brancaccio and Godson Michael Hopkins in better days. Over the off-season Hopkins did what he knew his Godfather would have wanted him to do. He finished the bike. 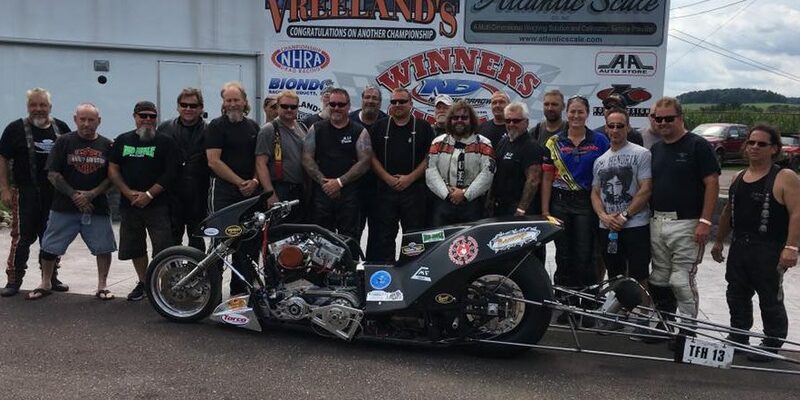 The beautiful Nitro Harley meant for Larry “Drums” Brancaccio, built by his Godson Michael Hopkins. 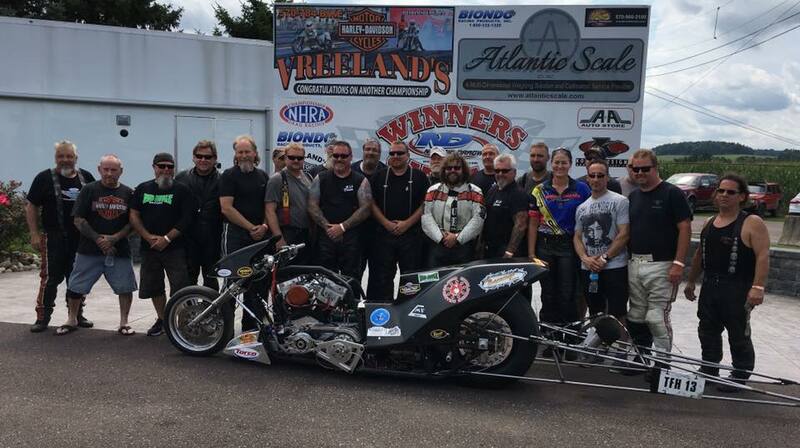 Hopkins and dozens of Brancaccio’s friends, family and colleagues gathered at Numidia Dragway in Catawissa, Pa., Aug. 19-20 to remember the fallen legend at the AMRA Vreeland’s Harley-Davidson Northeast Nitro Nationals. Longtime successful bracket racer Bill Rowe, Nitro Harley racer Rich Vreeland and many others helped organized the tribute. Rich Vreeland talks about the tribute to Drums. 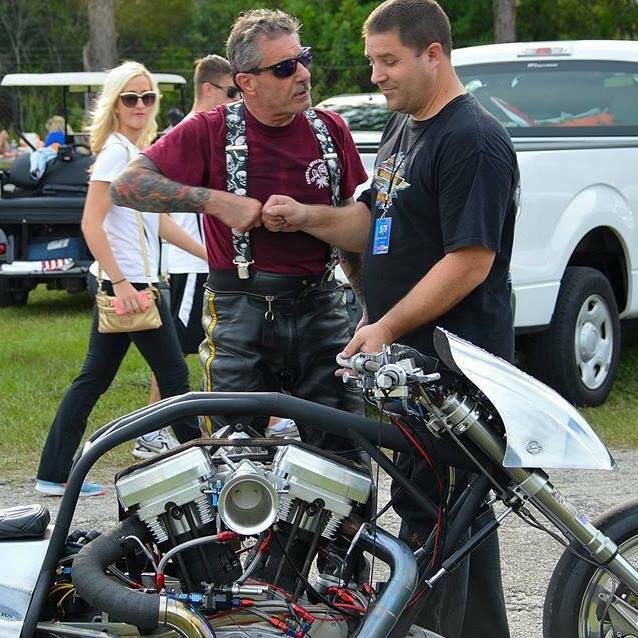 Nitro Harley racers Dean Comunal and Armon Furr recall their old friend. “The Bad Apple” Tracy Kile reminisces about one of his best friends. Sportsman standout Donnie Huffman says he misses the days of Drums stopping by his pit. Marty and Jane from the AMRA remember Drums. Hopkins had a special treat for everyone who came to pay tribute to his Godfather. Hopkins brought the bike that was intended for Drums. It was not merely a display. The machine was 100-percent complete and ready to go down the track. Perhaps there was no better, or more appropriate, event for the motorcycle to make its debut. The only curiosity, and perhaps detriment, was the untested bike had yet to go down the race track. Hopkins said he had butterflies in his stomach at the thought of a first pass. What happened in the opening round of qualifying was truly magical. Typically, new bikes on their first pass don’t make impressive runs. More often than not riders click off the throttle at the 330 mark, or even before, in an attempt to work the bugs out. In a hot Saturday afternoon session, that proved to be challenging for even the riders in mid-season form, watch what Brancaccio’s good buddy Tracy Kile does on Drum’s bike at about the 20:00 minute mark of the video below. It was a powerful, meaningful and emotional tribute for Kile, Hopkins, the AMRA and everyone involved. With smiles on their faces, many said they felt like Drums was at the track that day. In an equally moving tribute, several friends and colleagues of Drums gathered to make sure the legend was honored in the winner’s circle one more time. 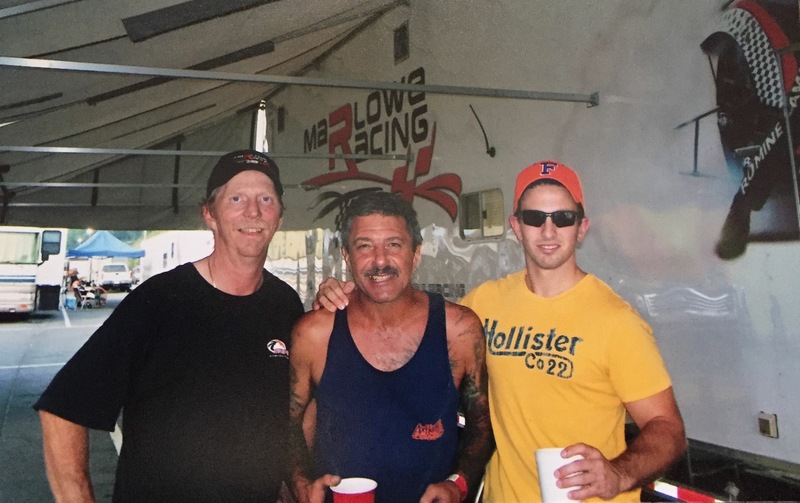 Close friend of Drums, television producer and videographer Timothy Scott “Bubba” Barnes, passed away in 2008, Larry “Drums” Brancaccio, 1957-2016, and Jack Korpela of Cycledrag.com at Bristol Dragway in 2007.